School starts in less than a month! Why not free rewards while hunting online for the best deals on your school supplies? We have already purchased some of our school supplies, but there are still more to buy! 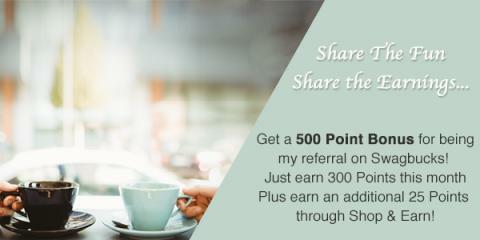 All throughout August you can earn large bonuses when sign up as my referral on Swagbucks. Swagbucks is a rewards site where you earn points (called SB) for things you’re probably doing online already, like searching the web, watching videos, shopping, discovering deals, and taking surveys. Then you take those points and exchange them for gift cards to places like Amazon, Shutterfly, Cineplex or PayPal cash. 3. That’s it. It’s super easy, and Swagbucks is for real. I use it myself, and most recently I’ve redeemed my points for a Cineplex gift cards. I was able to take the entire family to see “Christopher Robin” without taking any money out of our budget! *Disclosure: I am a member of the Swagbucks Influencer Program.